Baptist Health is planning a massive redevelopment of its downtown Jacksonville medical campus. Across the country, medical center expansion projects are being utilized as a catalyst for creating healthy communities where walkability and social engagement become a part of the economic transformation. In Orlando, Florida Hospital is in the midst of turning its campus, anchored by a Sunrail commuter rail station, into a 172-acre mixed-use transit oriented development called Health Village. In the Midwest, Detroit’s Henry Ford Hospital continues to actively work on turning its once isolated medical campus into an anchor for a human-scaled neighborhood. 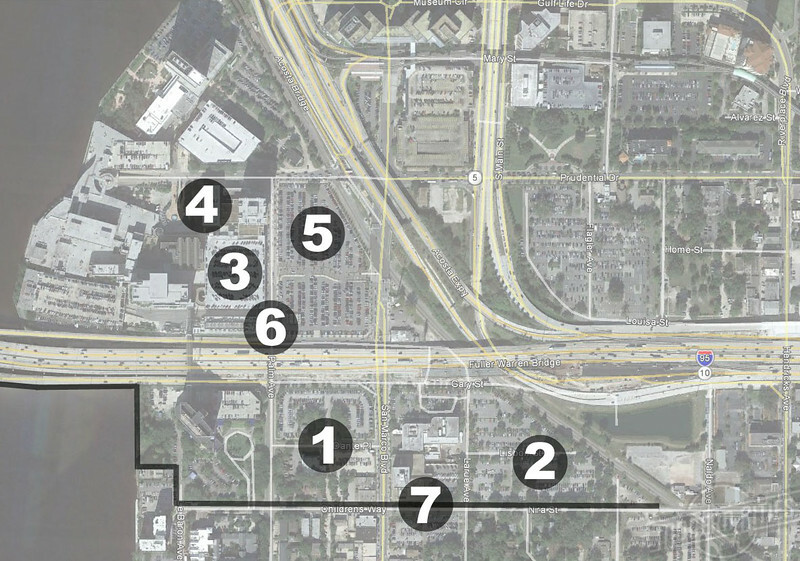 Proposing a massive redevelopment of its own, Baptist Health may be in the midst of turning its downtown Jacksonville campus into a walkable district that seamlessly blends the Southbank and San Marco together. 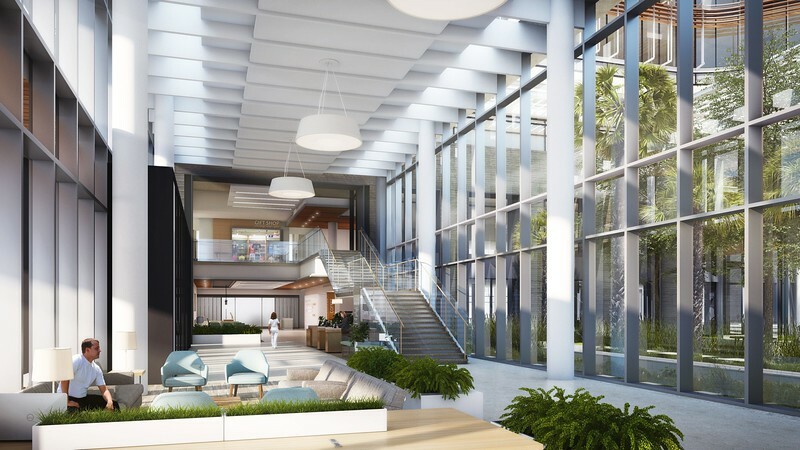 Conceptual master plans and renderings obtained illustrate Baptist Health’s intention to create a grand central entrance experience, along with improved connectivity and wayfinding throughout its Southbank medical complex. Construction on a new seven-story, 2,200 space parking garage bounded by Palm Avenue, Prudential Drive, the FEC Railroad and San Marco Boulevard, could be underway by the end of the year. Once complete, an existing five-level parking garage on Palm Avenue would be demolished and replaced with a grand central medical entrance and greenspace. In addition, the Laurette J. Howard Doctors Building at 920 Prudential Drive would be demolished and replaced with a new 11-story children’s tower to accommodate current and future clinical needs. As a part of the redesign, Palm Avenue would be widened into a context sensitive boulevard with a median, wider sidewalks and landscaping, improving the corridor’s pedestrian experience. Also, Baptist Way would be realigned, providing a direct connection between the medical center’s new central entrance and San Marco Boulevard. The downtown campus redevelopment project adds to the list of significant expansion projects currently underway at Baptist Health campuses throughout Jacksonville. 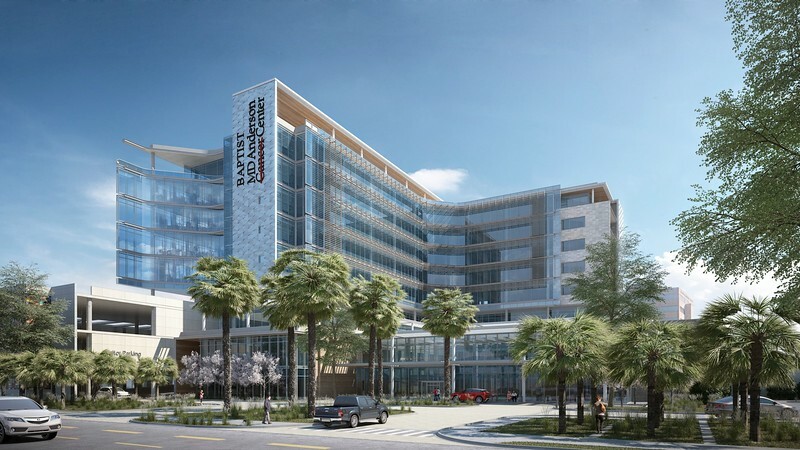 In June 2016, Baptist Health MD Anderson Cancer Center broke ground on a nine-story, 330,000-square-foot outpatient building at I-95 and San Marco Boulevard. Expected to be completed in mid-2018, the project also includes the construction of a multi-use path between the St. Johns River and FEC Railroad tracks along Nira Street. Outside of Jacksonville’s urban core, the health care system’s projects include an $85-million, eight-story tower is being added at its Baptist Medical Center South campus and a new $36 million, three-story North Jacksonville medical campus at I-295 West Beltway and Dunn Avenue.